Good afternoon, space fans! It’s been another week of excellence in orbit! The "bulls-eye" of the Richat structure, North Africa. 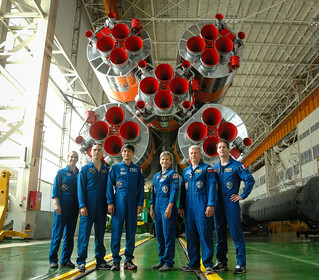 The Expedition 48-49 crew, comprised of NASA astronaut Kate Rubins, cosmonaut Anatoly Ivanishin and JAXA astronaut Takauya Onishi, are making final launch preparations in Kazahkstan. They will launch from the Baikonur cosmodrome on July 6th (July 7th, Kazakhstan time) aboard a Soyuz MS-01 spacecraft. The launch will be aired on NASA TV, if you want to tune in to watch them space out! Rubins, who considers herself a "virus hunter" and who works with the U.S. Army Medical Research Institute of Infectious Diseases and the Centers for Disease Control and Prevention, talked about her enthusiasm for finding out how microgravity will affect "the world of microbiology, molecular and cellular biology and human physiology" in a recent interview with ABC News. In other station science news this week, a contract was awarded to Paragon Space Development Corporation of Tucson, Arizona, for their water-recovery system that extracts potable water from human urine. The Brine Processor Assembly is schedule for a test flight in 2018, and could be a major aid for astronauts bound for Mars. NASA astronaut Jeff Williams used the onboard 3-D printer to create “coupons”, which are prototypes of possible tools that could be created on the station. Identical coupons were also 3-D printed on the ground, then compared to the space-created ones to assess any differences or possible flaws in the two. Since every ounce of gear sent into space costs money and planning-time to factor its weight into a payload, the ability to create tools or small spaceship parts in orbit (or beyond) on demand could be tremendously useful to the crew. Williams also captured some of his spectacular space shots for us Earthlings to enjoy! Damn, do we look good from orbit! yet created by Orbital ATK company, is tested in Promontory, Utah. The booster will someday launch missions to Mars. Some stunning aurora-aura over Australia! Glaciers in the Canadian Cascade Mountains! That's all for this week, space fans! See you next Sunday will all the news on our newest spacefarers, and more! Watch this space! Expedition 48-49, plus backup crew, and one hell of a tight ride! I love space so much. Its vastness is so daunting and impossible of measure. I wanna be an astronauttttt..